Cyanobacteria are known to be a rich source of novel metabolites of significant importance from antimicrobial activities’ point of view. Another important characteristic is their nitrogen-fixing capacity which has drawn attention to agriculturists and researchers. Cyanobacteria acquire niches in different agricultural soils, where they potentially contribute toward biological nitrogen fixation and solubilization of immobilized phosphates and thereby improve soil fertility and crop productivity. 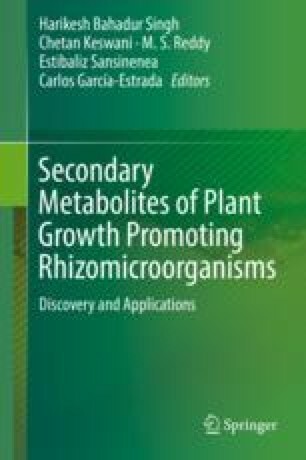 In addition to their properties of natural fertilization and balancing mineral nutrition in soil, a number of cyanobacteria are known to release different biologically active substances like carbohydrates, polysaccharide proteins, vitamins, amino acids, and phytohormones, which participate as elicitor molecules to boost plant growth and help in defense responses against biotic and abiotic stresses. These metabolites affect the expression of certain genes in the host plants which ultimately leads to qualitative and quantitative changes in the phytochemical compositions in plants. However, all these prospects are still in their infancy, and thorough investigations are required in searching more potential strains of cyanobacteria and genetically variable strains to ensure maximum benefit out of the strains. This chapter reviews the role of cyanobacteria in triggering growth and development in plants and prospects of their utilization in agriculture.